subroutine The Runner trashes an installed program. subroutine The Runner loses click, if able. A ghost image of it could be made out in the static of his BMI. He hoped never to run across the real thing again. AI hate, a deck archetype once dominated by the ineffectual and silver-bullet Swordsman, has been in a slow resurgence since the overwhelming dominance of Faust. ICE like Chiyashi, Bulwark, Turing, and (to a lesser extent) DNA Tracker and Data Ward have put forward high-cost, multiple-sub ICE that are either must-break propositions or otherwise have direct penalties for having installed AIs. Chiyashi forces the Runner to mill their stack, and Bulwark pays back the Corp on encounter. Turing's sub can't be broken by AIs at all, much like Swordsman. However, neither of these penalties (with the exception of Turing) make it any less difficult for a Runner to get through the ICE in question. Chiyashi's milling is at worst a nuisance to a Runner with recursion, and Bulwark actually gives the Runner bad publicity to use. In addition, one of the big deals with AI hate cards is that they're inherently silver bullets - they're just not great when not playing against AI. Enter Conundrum! Without an AI installed, it's an 8-to-rez, 4-strength ICE with 3 subs. That's an awful rez-to-strength ratio. But with an AI, it jumps in strength to a boggling 7! Considering that most AIs have issues with either pumping strength (Darwin, Maven, Aumakua) or breaking subroutines (Overmind, God of War, Atman), Conundrum becomes a serious obstacle. In addition, where both pumping and breaking are cheap, AI breakers often have some kind of catch to them (Alpha, Omega, any of the devas). Like Wraparound, Conundrum forces the Runner into a... well, conundrum. Do they trash their AI and dig for a decoder, knowing their tempo will suffer? Do they push through the ICE, paying the costs involved, knowing they'll have to do it again and again? Not to mention that unlike Wraparound, Conundrum retains its strength as long as an AI is installed - you can't sneakily install a 1-off breaker to counter it. You either have to lose the AI or grit your teeth. Unfortunately, Conundrum has another drawback on top of its ridiculous rez cost. It only really has one sub that needs to be broken: the End the run. 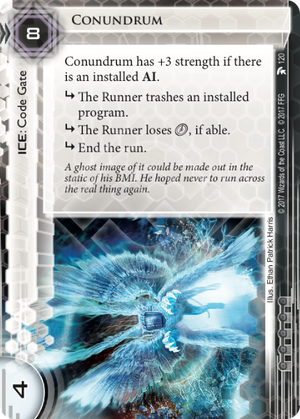 The "lose a " subroutine hurts, but only has teeth in HB decks with cards like Heinlein Grid or Ryon Knight, and a poor Runner (or one running last click) can just let it fire to save money. On top of this, the trashing subroutine has the ever-deadly clause on it: "The Runner trashes an installed program". Not only does this mean they can do stupid things like trash power-counter breakers for recursion later, they can also just trash their AI for an easier run round next time. One of the subroutines actually helps the Runner solve this conundrum, should they choose to fire it. Honestly though, my favorite thing about Conundrum is that it blows D4v1d out of the water (since it isn't an AI), and makes 4tman sad (if anyone even plays 4tman anymore). In conclusion, Conundrum is another weapon in the AI hate arsenal and is well worth slotting if you're entering into an AI heavy meta. It's not even that bad against decks without AIs, but it's not that great either. It's an influence-free alternative to Chiyashi or Bulwark if you're not playing or and is more effective against AIs to boot. Also, it's some kind of TV-headed chimera that sears itself onto people's brains, so there's that if you're into it. Yog.0 - Can't do it, unless you shenanigans its strength up, in which case 0. Black Orchestra - 6 at 4 strength. 9 at 7 strength. Force of Nature* - 7 at 4 strength. 10 at 7 strength. Wyrm - oh boy. uh, 6 to boost, 7 to weaken, 9 to break... 22. Phew. Eater - 8. Also, you can't access any cards. God of War - 14 and 3 virus counters. Darwin - 6 up front, and 7 over time to pump strength. Faust - 6 cards from your grip. Peregrine - 6 at 4 strength. 9 at 7 strength. Cerberus "Rex" H2 - 3 and 2 counters at 4 strength. 6 and 2 counters at 7 strength. Leviathan* - 6 at both 4 and 7 strength. Peacock* - 8 at 4 strength. 10 at 7 strength. Abagnale - 5 at 4 strength. 9 at 7 strength. Passport - 5 at 4 strength. 9 at 7 strength. Crowbar - uhhhhh... 4 installed icebreakers and a at 4 strength, and 7 installed icebreakers and a at 7 strength. Mammon - 8 to boost, 3 to put power counters on and break. Vamadeva - can't do it. no way, no how. Aumakua - 3, plus 7 virus counters. Refractor - 4 (one of which must be stealth) at 4 strength. 5 (two of which must be stealth) at 7 strength. Houdini - 5 (one of which must be stealth) at 4 strength. 7 (two of which must be stealth) at 7 strength. Gordian Blade - 5 at 4 strength. 8 at 7 strength. Cyber-Cypher - 3 at 4 strength. 6 at 7 strength. Inversificator - 5 at 4 strength. 8 at 7 strength. Torch* - 3 at 4 strength. 6 at 7 strength. Sage - okay um... 6 and 4 free at 4 strength. 6 and 7(!) free at 7 strength. ZU.13 Key Master* - 6 at 4 strength. 9 at 7 strength. Savant - uhhh... 4 and 4 free at 4 strength. 4 and 7(!!!) free at 7 strength. Mass-Driver - 9 at 4 strength. 12 at 7 strength. Or nothing, if you broke the previous ICE with Mass-Driver. Chameleon - if shenanigansed to a higher strength, 3. Atman - 3 to break up front, 7 one-time cost to boost. Brahman - 7 and 1 installed non-virus program to the top of the stack. Alpha* - 9 and it's got to be the first ICE. Sadyojata - no can do. Dai V - 8, and 2 of them have to be stealth. Maven - 6 and you have to have seven installed programs. GS Striker M1 - 4 at 4 strength. 6 at 7 strength. Sharpshooter - ! Conundrum is not a destroyer, despite having a trash subroutine! Crypsis - 10 and a virus counter if you want to keep him on board. Baba Yaga - ???????? whatever ??????? Overmind - 7 and 3 power counters.